The grapes ripened well in advance which was logical following remarkable early budding then flowering. Full bloom around June 10 with fantastic weather, then really favourable atmospheric conditions during the season with lots of sun, high temperatures and perfectly spaced-out rainfall, promising a very high-quality vintage year. With these great conditions, the grapes were fairly in advance and in mid-September there was indeed a great harvest, rich in sugar and well-balanced, so Alsace producers could start picking. Monday September 27 for the Riesling, Gewurztraminer and Tokay Pinot Gris grape varieties. But the rainy weather which invited itself right at that moment started to spoil things, disturbing the harvest and not allowing this vintage to reach the summits everyone objectively had been hoping for. On the quantity level, and considering the damage of heavy hail in several sectors of the vine-growing region, notably to the north and south – 4000 hectares affected – it was a volume close to 1,100,000 hl which was picked this year, making about a level equal to the average over the past 5 years. Despite the weather, the quality is definitely there, notably for the Pinot, with an excellent composition and good acidity-alcohol balance. 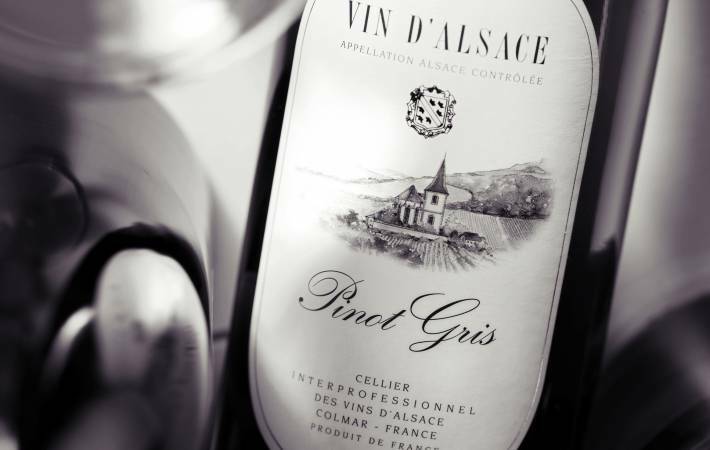 The 1993 Alsace wines are totally along the same lines as the two previous ones - 1991 and 1992 – characterized by a great typicity in the different grape varieties. The colour has a clear, not very evolved golden nuance. The nose is smoky, spicy with hints of cumin, cloves and a touch of exotic fruits which wine is breathing. A dry attack on the palate, generous and deep, tight with a touch of butter, and a slightly tannin-like finish. A beautifully-matured wine in a style reminiscent of those from the 1060’s (only 7 g/l of residual sugar, last tasted in February 2011). From early on its colour resembles a cognac due to the juice-colouring effect from berry skin. A fragrant nose, complex, revealing itself step by step, with touches of roasted grape, hazelnut, honey and smoke. The palate is fine, sweet, flavoured with smoky and slightly iodine hints. The precision of this wine is remarkable, and the strong minerality contrasts with the mid-palate roundness to give a certain bitter taste. If fans of sweet wine will find the cuvée a bit wild and inappropriate to accompany desserts, those who adore Grand Cru Rangen will enjoy a remarkable wine revealing that the terroir can also shine-through with dessert wines. (13.2% of alcohol, 85g/l of residual sugar. Last tasted in January, 2005). A vintage year which started off well but where grape-picking time was disturbed by rain, accelerating the harvest of the most fragile grapes. With a good acidic maturity, Riesling from good terroirs evolves well and in a very homogenous manner, just like the 1999 vintage year. And what a pleasure even today to drink the best Gewurztraminers, a discreet sweetness with significant spicy character allowing for wonderful food-wine pairing.